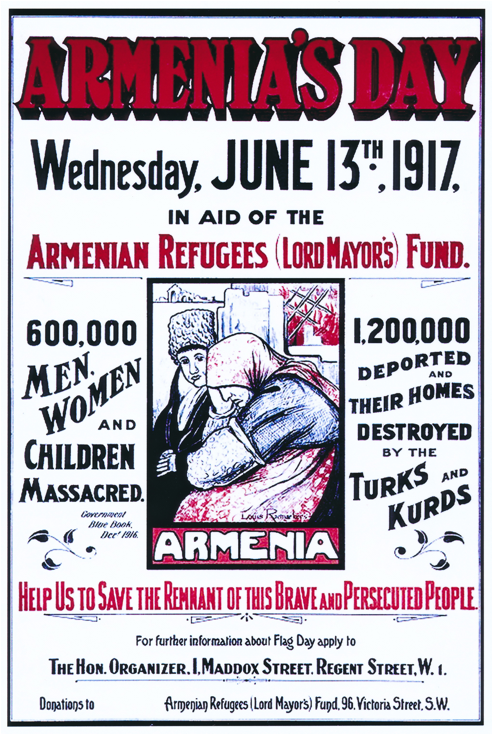 Dutch ‘Cartoonist’ Louis Raemaekers’ Poster of 1916 entitled “The Lord Mayor London’s Appeal for Help for the Armenian People”: filling in some details, and a call for input as to where ‘Originals’ might be located. We have learned, albeit belatedly, that is to say well ‘after the fact’ that there is an area of study that is referred to by specialists as “public history.”  The approach to public history is stated to be that of making history relevant in the public sphere. This is a laudable goal it seems to us. Reproduced from an article in The Literary Digest vol. 55, August 11, 1917 pgs. 24-25. Recently, our friend from England Peter Muir visited us and we took advantage of his immense expertise in photography to get a good quality photograph of one of our framed ‘relief posters.’ This chore was especially challenging since the one that we wanted to cover in this posting is behind glass, and behind a cluttered desk. Thanks to his efforts, it came out very well and the printing beneath it, oftentimes obscured in cases of poor photography or even cropped off, was perfectly readable. We tried to be good students and learned a lot. At the bottom of the Raemaekers’ Lord Mayor’s Fund poster we can read: “Vincent Brooks, Day & Son, Ltd., LITH. [ographers] DONATIONS URGENTLY NEEDED TO REBUILD HOMES OF THE ARMENIAN PEOPLE BEFORE THE COMING WINTER. Hon. 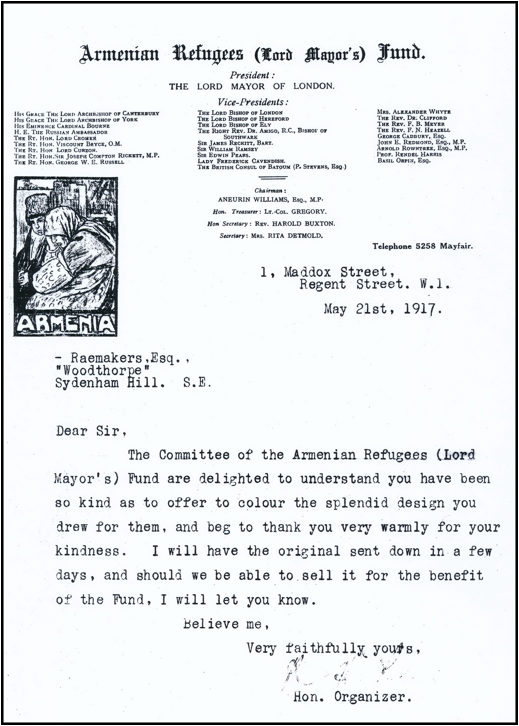 Treas: THE ARMENIAN REFUGEES (LORD MAYOR’S FUND, 96 VICTORIA STREET, London, S.W. “A limited number of Signed Artist Proofs of this Picture (which has been specially drawn for the fund by Mr. LOUIS RAEMAEKERS) price ₤2 2s. each, and unsigned copies at 10/6 [10 shillings sixpence], may be obtained at the above address.” (Emphasis is ours). The date is certainly very wrong on the French work—five years off is not insignificant. Apparently it was a low priority for those who selected the photograph for use to check this out. The designation of 1917 by Dr. Laycock is perhaps pardonable because who might have thought that an error in dating would exist in the IWM database? [That is other than individuals the likes of us!] In the October 1918 issue of the journal The World Court. A Magazine of International Progress pg. 576 the Raemaekers image is included, again without any caption but that which is drawn on the poster itself – namely ARMENIA. Enlargements of the two sides of the page follow. Note signs of ruined buildings such as churches (upper left) and burned, collapsed structures (upper right). 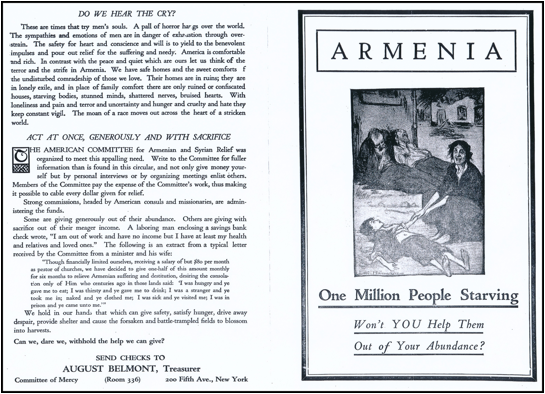 The Raemaekers image is also used on a back cover of another issue of the New Armenia, this time with some coloration, seeking funds for the “Armenian Liberty Fund” operating out of Boston, Massachusetts. We have attempted to reproduce the exact color seen on a print copy of the relevant issue. Our own copy, stains and all, which were so expertly photographed by Peter Muir, bears the ‘faux signature’ of Louis Raemaekers. [It is not really a signature; rather the name in neatly hand-printed. See photo of ‘our’ poster.] The poster bears no indication of an original signature, say in pencil, on the release. (For a large frontispiece photograph of Louis Raemaekers with his ‘real’ signature underneath see, for instance, Raemaekers’ Cartoons: with accompanying notes by well-known English writers (Doubleday, 1916). To top it off, we have never seen anything that bears even a hint of it being a ‘numbered print.’ ‘Our’ poster, like the others we are aware of, is a lithograph, and it states just that at the bottom “Vincent Brooks, Day & Son, Ltd. LITH.” If anyone owns or knows of an ‘original’ ‘signed’ copy please be good enough to share that knowledge with us. To continue, and as seems to be “par for the course” with us whenever we seek to learn more about photographs or other images, it has not been easy. We have wondered if we could track down any “really signed” posters, rather than what we thought were “faux signature-bearing ones. The answer to this, in part at least, came to us due to our knowledge that the Louis Raemaekers Archives are at the Hoover Institution, Stanford University. The Imperial War Museum in London lists the poster from 1917. From the letter we see that it was ready for signature in September 1916. It is not yet possible to make a definitive statement on whether the coloring of the print referred to is the only example of what we present below. 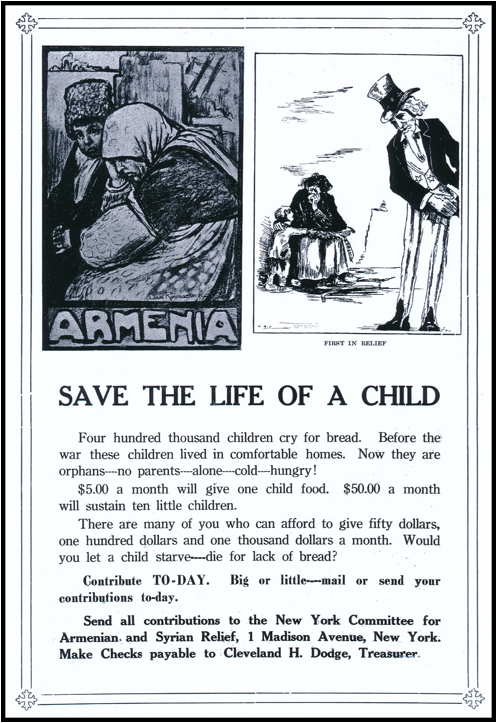 It will be noted that color has been employed in the page advertising “The Armenian Relief Fund.” If we were to venture an ‘educated guess’ we would say that the colored poster is the one shown. We say this because there are a couple of libraries in the USA that have copies of the colored poster, e.g. University of North Carolina, Chapel Hill, and certainly this poster exists in a few private collections. 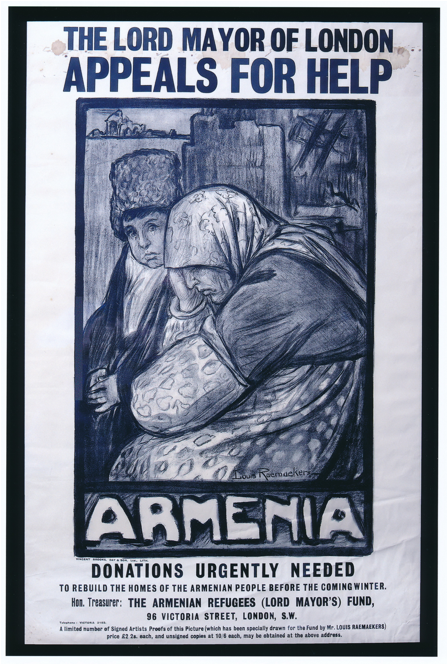 Finally, we may ask whether there were other posters drawn by Louis Raemaekers relating to Armenians. 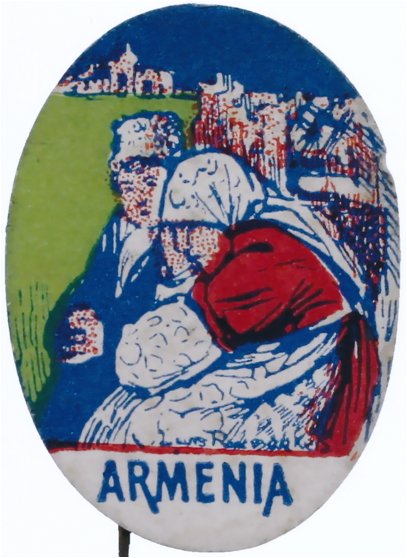 The short answer is “No.” But, one of his drawings of a more generic nature, but initially drawn in connection with the German atrocities going on in Belgium, was used in connection with fund raising efforts for Armenia as well. We show the ‘cartoon’ in the photographs below. The page below giving greater detail of the scene portrayed on the right hand side of the double page scan above, was scanned from our copy of Cartoons Magazine vol. 8, no 1, July pg. 149. 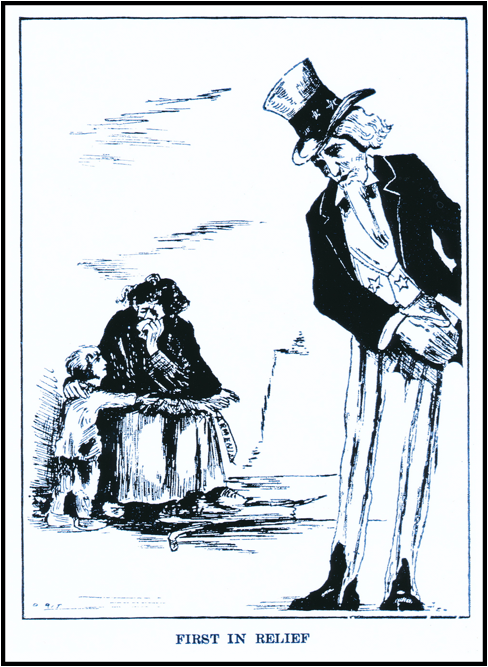 We also own a post card (not shown) entitled at the top right “La Guerre Civilisatrice.” [The Civilizing War.] The bottom left says in English, “The “Kultur” has passed through here.” On the lower right it reads in French “La “Kultur” A Passé par ici.” On the back, there is a statement that the card is being sold for the benefit of the French wounded [Se vend au profit des blesses de France”]. Finally, comments have apparently been made by some readers of Jo Laycock’s book on the decided appropriateness of the selection of the Raemaekers’ image for use on the cover of her work Imagining Armenia. Just why it is so appropriate escapes us. There is no text provided to go with the poster. It even lacks the original heading The Lord Mayor’s Appeal for Help, and no mention is made whatever of Armenia on the drawing. It seems that the prime purpose of using it was not to convey a desperate need at a pivotal time and defining moment in the country’s history. 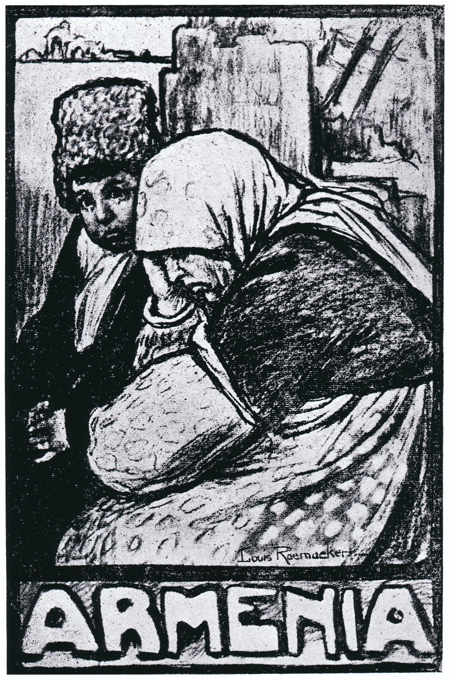 Indeed, in our opinion, it does little to evoke any realistic sympathy for Armenians in distress. One might even be tempted to say that the females in the image hardly appear to be especially needy. The karakul lamb hat on the younger girl and what appears to be her ample scarf and her untattered coat hardly project need. What then is the purpose of the Raemaekers’ image used in the context of Laycock’s book? Are we to be imaginative or perceptive enough to figure out that the ‘Mother figure’ on the right in her more traditional peasant garb, gayly or gaudily colored outer garment and kerchief, strikes a pose of grief and lament. Her daughter, if indeed she is her daughter, may be seen as representing a more modern generation, more stylishly dressed. One that is less grieving or lamenting, but perhaps a bit more introspective but still quite worried as to what the future will bring. Whatever. Just as Humpty Dumpty said about words, one can perhaps say about pictures, namely “It means what I choose it to mean – neither more nor less” (Through the Looking-glass by Lewis Carroll, 1872). We obviously do not subscribe to the viewpoint that we can make images, especially of that period of national tragedy, into whatever we wish. More and more we see that nominally scholarly books are evaluated positively based on how attractively and engagingly they are written rather than what they accurately communicate due to original and hard-won research, even if a much more useful book that emerges from new fundamental truths that have been gained from serious investigation is structured and written in a less engaging fashion. That is probably why so few copies of scholarly books that constitute real contributions are sold today, and prices are so high. Even so, prices tend inevitably to be high whether the book will remain important or not long after it has run its course. We again thank Hoover Institution at Stanford for allowing access to the Raemaekers materials. We thank Peter Muir once more for the great photography job. We thank Pamela Apkarian-Russell for giving us access some years ago to the Raemaeker pins from her collection, and for having sold us the Lord Mayor of London Raemaekers poster in the first instance! 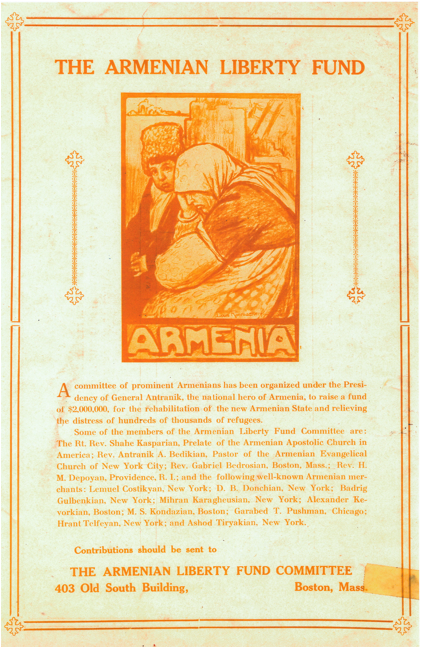 The CRL made print copies of the New Armenia available for study and we are grateful for this. This would not, of course, been possible without Stony Brook University’s membership in the Center for Research Libraries. We rely heavily on the Stony Brook University Libraries, and sincerely offer them our thanks. For some additional details on what constitutes “public history” see the National Council on Public History website at http://ncph.org/cms/. n.a. 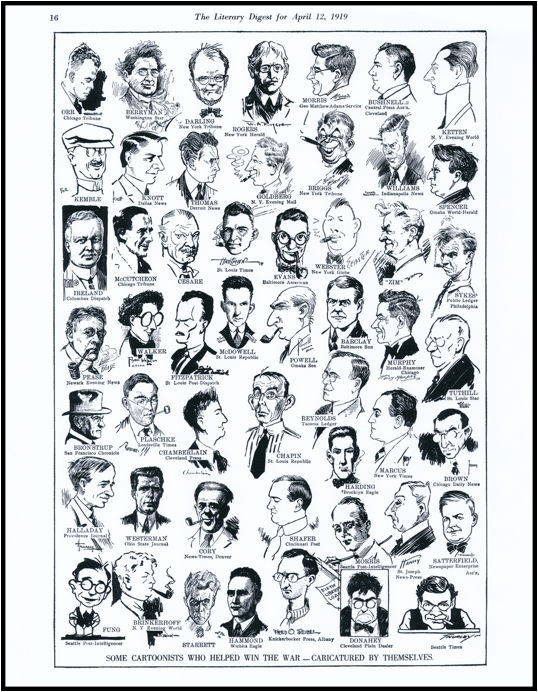 (1919) “Some cartoonists who helped win the war – caricatured by themselves”. 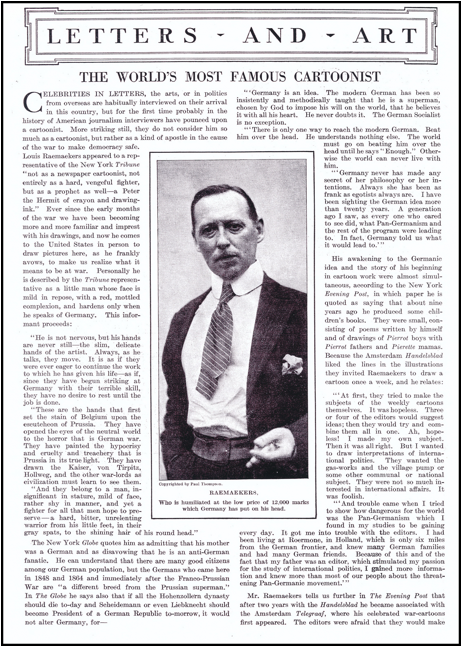 The Literary Digest for April 2, 1919 Vol. 61, 16. 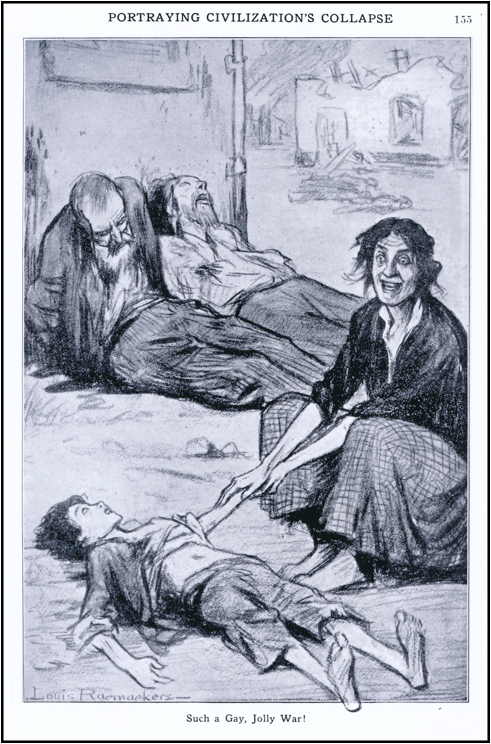 See for example our “Conceptualizing the Attempt to Annihilate the Armenians of Turkey: two 1915 cartoons by William Charles Morris.” These were posted for us on April 23, 2014 on Groong Armenian News Network at http://www.groong.org/orig/ak-20140423.html. n.a. (1915) “The War’s greatest cartoonist.” The Literary Digest for September 11. Vol. 51, 526. Raemaeker’s dates are 6 April 1869 to 26 July 1956.
 n.a. (2003) “Ailleurs, hier, autrement: connaissance et reconnaissance du génocide des Arméniennes.” Revue d’histoire de la Shoah. Le monde juif (Paris) No. 177-178 Janvier-Août 2003, 593 pages of this special (and excellent) issue (636 pages in all) are devoted to the Armenian Genocide. 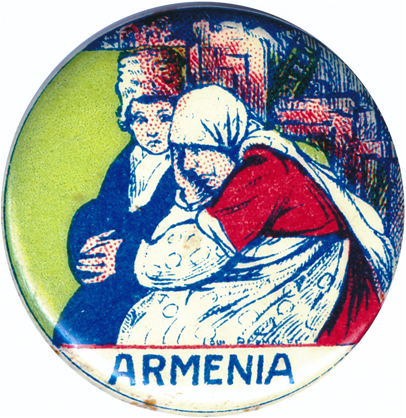 (1917) The New Armenia (New York) Vol. 9, no. 22 (December). (1916) “The cartoonist and his power.” Ararat. 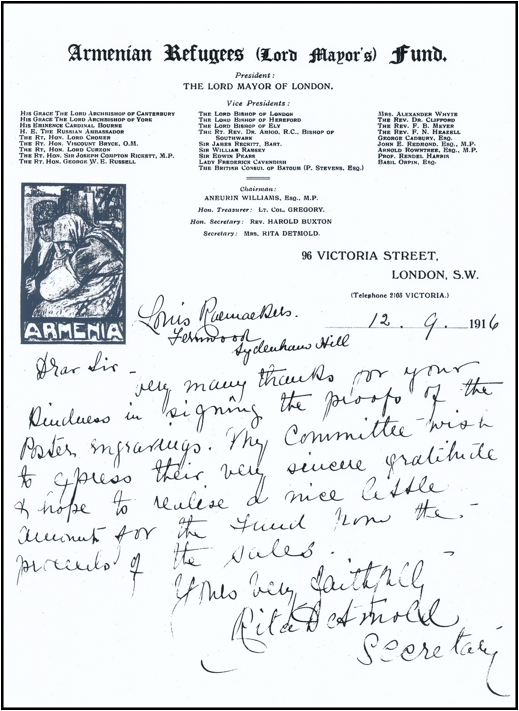 A Searchlight on Armenia (London) vol. 4, no. 37, July, 1916, pgs. 17 - 18. The Imperial War Museum data on these posters may be found at:- http://www.iwm.org.uk/collections/item/object/22376. Interestingly, in a book review in the Daily Telegraph (London) by Helen Brown of the 2007 Constable printing of Taner Akcam’s book A Shameful Act: the Armenian Genocide and the Question of Turkish Responsibility captioned “ ‘The River flowed with blood’ Helen Brown applauds a scrupulously researched history of human liquidation that makes a legal case for genocide” we encounter another dating. A reproduction of the Raemaekers poster, minus the part at the bottom giving the address and particulars, offers the dates, “…campaign poster, c. 1915-1916.” We thank our friend Nicolaos Hlamides, living in England, for sending us this review soon after it came out. We thank Pamela Apkarian-Russell for access to these pins from her collection.